New High-Pressure SCR for Two-Stroke Engines Lands First Reference. Uniquely, MAN Energy Solutions offers both SCR and EGR as NOx solutions within two-stroke sector. MAN Energy Solutions has announced the very first order for its SCR-HP (Selective Catalytic Reduction – High Pressure) product. Mitsui (MES) has ordered 3 × SCR-HP (cluster 3) units in connection with the building of three 87k-dwt bulk carriers for the Ocean 21 Holdings company. Each bulker will be powered by a single MAN B&W 6S46ME-B8.5 low-speed engine delivering 9,900 kW at 84 rpm, and aspirated by an MAN TCA66 turbocharger. The engines will accordingly meet IMO Tier III emission standards. Delivery dates for the three SCR-HP packages are set respectively for December 2019, and March and May 2020. MAN Energy Solutions introduced SCR-HP along with licensee, MES, in 2017. The development of the new system is based on MAN’s in-house competence with four-stroke engines, for which it can already reference more than 650,000 operating hours. The MAN SCR-HP is available for two-stroke engines of all bore sizes and reduces – through internal catalytic reaction – NOx exhaust emissions to IMO Tier III limits. With specially developed honeycombs and honeycomb materials, as well as an integrated mixing unit, the overall size of the reactor has been drastically reduced compared to typical market designs and its medium-speed counterpart. Exhaust gas recirculation (EGR) is an internal engine process that prevents the formation of NOx by controlling the combustion process, while Selective Catalytic Reduction (SCR) is an after-treatment method that uses a catalyst and an additive to reduce the NOx generated by the combustion process. 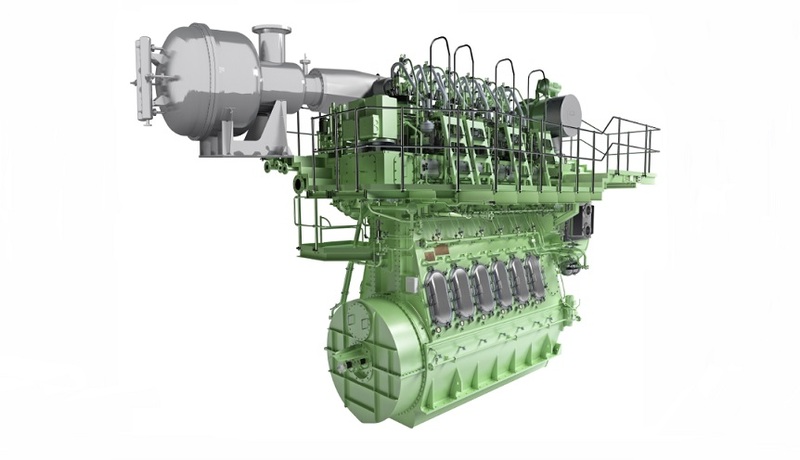 The SCR-HP comes in six frame sizes, covering engines up to 25 MW with one reactor for the entire exhaust stream. Larger engines will require two reactors, which can be arranged in a multi-setup similar to turbochargers. The SCR-HP system consists of the reactor – including mixing unit, urea injection lance, honeycombs and soot blowers – along with a module-based supply system, as well as the reactor’s control unit that communicates with the engine-control system. The SCR-HP system is available for Scheme A and Scheme B classification approval. Scheme A approval includes a certification of the complete system on the engine test bed, SCR and original piping. Approval via Scheme B reduces complexity for all involved parties. The engine is tested in IMO Tier II mode on a test bed. MAN Energy Solutions then models the SCR system and calculates the Tier III mode. On the parent engine, this mode is certified on board during engine commissioning. This Scheme B approval is confirmed by several classification societies and reduces the test demands required of the engine licensee. The process is well established in MAN’s medium-speed sector, and over 100 systems are already in the order book awaiting Scheme B certification. MAN Energy Solutions enables its customers to achieve sustainable value creation in the transition towards a carbon neutral future. Addressing tomorrow’s challenges within the marine, energy and industrial sectors, we improve efficiency and performance at a systemic level. Leading the way in advanced engineering for more than 250 years, we provide a unique portfolio of technologies. Headquartered in Germany, MAN Energy Solutions employs some 14,000 people at over 120 sites globally. Our after-sales brand, MAN PrimeServ, offers a vast network of service centres to our customers all over the world.